We all dreamed that we'd one day marry Prince Harry, but now Hollywood royalty Meghan Markle has claimed the throne in a love story fit for the golden age of cinema. But dry your tears because this Royal Wedding Colouring Book is here to celebrate their impending nuptials! 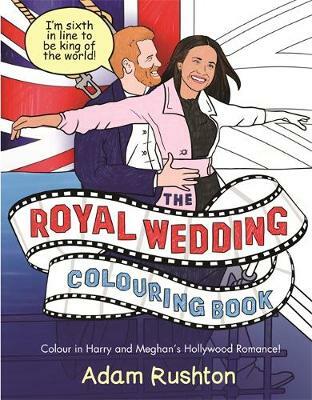 You can follow Meghan Markle's journey from legal to regal in this royal romp of a colouring book that features the happy couple in some of the most iconic film scenes in Hollywood history. Bring Prince Harry and his sweetheart Meghan Markle to life in classic scenes from Titanic ('I'm sixth in line to be king of the world! '), Jaws ('You're going to need a bigger moat'), THAT scene from When Harry Met Sally, The Shining ('Heeeere's Harry!') and A Streetcar Named Desire ('I've always depended on the kindness of gingers'), among many others. Packed full of beautiful illustrations fit for a princess, you can also colour in the most famous royal wedding dresses in history, and the bride and groom's happy family as they make their way to Windsor Castle. So what are you waiting for? Put on your hat, grab your confetti and your pencils and start colouring in!